Sticky x-ray: This lower body x-ray shows some of the 26 sewing needles floating around in a Chinese woman's body for the past 29 years. She's having surgey today to remove the first batch of needles, which were believed to be put into her by her grandparents shortly after her birth (Photo from Richland International Hospital)You would think this would certainly send you to the doctor a few times, living a quarter of a century with 26 sewing needles poking around inside of your body. A Chinese woman just found out the source of so many of her medical problems. Today, doctors are doing the first surgery to remove six of those little pokers form her body. Over her 29 years of life, doctors estimate that the pins have poked into Luo Cuifen’s lungs, liver, bladder and kidneys. And they suspect that they were imbedded into her body just days into her life by grandparents who wanted to harm her, well actually kill her. “That fact that she’s still alive is a medical miracle,” says Qu Rei, a spokesman for Richland International Hospital in Yunnan Province, China. The presence of the needles was a mystery to Cuifen’s mother, who wept when informed of her daughter’s condition. As an infant, Luo Cuifen cried a lot, but her mother thought she was a temperamental baby. How can this all happen and how can someone live so long in such a condition? Read on. Luo Cuifen’s first medical problems arouse as an infant when she had a wound in her lower back. 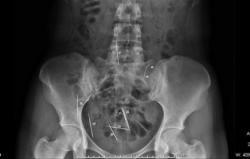 Her mother was startled to pull a sewing needle out of the wound. But for lack of money or medical insurance, the situation was never checked out by a doctor. At age 3, another needle emerged from her body around her ribs. It’s taken this long for a hospital to step up and volunteer to check her out and perform the necessary operations for free. After today’s operation, she’ll likely have five for six more surgeries to remove the remaining needles. Surprisingly, since her childhood she’s had a pretty trauma-free medical history. She’s married and the mother of a six-year-old son. Luo Cuifen’s medical situation came to light three years ago when she had blood in her urine. Now here’s the real scary part. Doctors and family members believe the woman’s grandparents may have put the needles into their granddaughter. They always wanted a grandson and upon hearing a fortune teller say their granddaughter was cursed, they embedded the needles into the baby. Because China has a one-child policy, it’s not uncommon for families to practice infanticide on baby girls to give parents another chance to have a baby boy. Boy to girl ratios in China are 119 to 100 compared to 107 to 100 in industrialized countries. Did you even read the article? First of all, Luo Cuifen was born in CHINA, a country where there is a ONE CHILD RESTRICTION. In China, it is important to have a son because it is the son that supports the grandparents and parents in their old age and carries on the family name. The social aspect in regards to whether or not boys listen or even the fact that female counterparts are needed in order to procreate is irrelevant. To be frank, the fact that young men do drugs at the age of seventeen is also a stereotype. However, this story is much of a tragedy, and my prayers are with this woman in her time of need and pain.